We love surprises in musical performances. No, not the quick wardrobe changes or special guest artist type, although those are cool too. We're talking about those surprises when you think an arrangement is headed in one direction, but it quickly does a 180 spin into otherworldly goodness (we're calling copyright on that phrase if it's not already taken). And The Caledonias from Queen's University give us exactly that in today's #WCW. 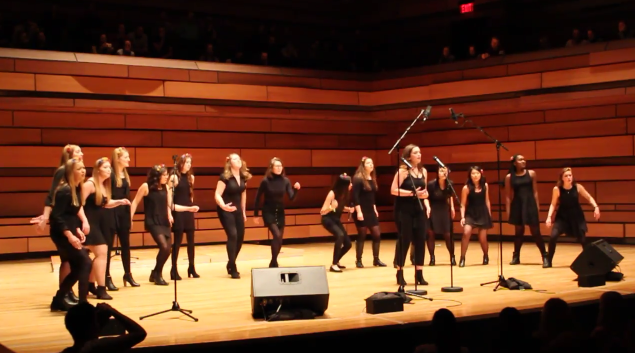 As competitors at this year's Queen's A Cappella Competition the female dynamos completely flip the script on their opening number as they start with a lovely and innocent cover of Dougie MacLean's "Caledonia" then abruptly transitions to a kick-a**, rhythmic, showstopping rendition of Bishop Briggs' "River." The contrast between the two soloists contributes so much to the range and epicness of the performance, which is further enhanced by the constant stomp and clap routine by the backing group. This is easily one of our favorite #WCW of the year.